AT&T Park is the site of the matchup between the St. Louis Cardinals and the San Francisco Giants on Saturday, September 2, 2017. The probable starting pitchers are Lance Lynn for the Cardinals and Chris Stratton for the Giants. St. Louis opens at -142 while San Francisco opens at +132. The Cardinals have a 69-56-8 over/under record and a 63-70-0 run line mark. The Giants are 57-79-0 against the run line and have a 62-63-11 over/under record. The Cardinals have a 67-66 overall record this season. Starting pitcher Lance Lynn has a 10-6 record with an earned run average of 3.14 and a WHIP of 1.17. He has 132 strikeouts over his 157.2 innings pitched and he's given up 124 hits. He allows 7.1 hits per 9 innings and he has a FIP of 4.77. The bullpen has an earned run average of 4.02 and they have given up 404 base hits on the year. Teams are hitting .247 against the bullpen and they've struck out 420 hitters and walked 150 batters. As a team, St. Louis allows 8.7 hits per nine innings while striking out 8.3 batters per nine innings. They are 8th in the league in team earned run average at 3.99. The Cardinals pitchers collectively have given up 1,156 base hits and 528 earned runs. They have allowed 152 home runs this season, ranking them 25th in the league. St. Louis as a pitching staff has walked 399 batters and struck out 1,094. They have walked 3 men per 9 innings while striking out 8.3 per 9. They have a team WHIP of 1.30 and their FIP as a unit is 4.09. As a team St. Louis is hitting .261, good for 8th in the league. The Cardinals hold a .431 team slugging percentage and an on-base percentage of .337, which is good for 6th in baseball. They rank 10th in MLB with 8.9 hits per game. Matt Carpenter is hitting .243 with an on-base percentage of .378. He has 106 hits this season in 436 at bats with 63 runs batted in. He has a slugging percentage of .440 and an OPS+ of 115. 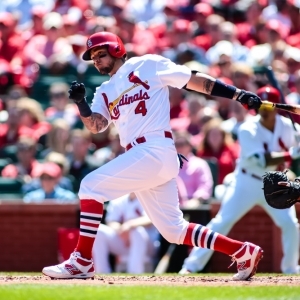 Yadier Molina is hitting .280 this year and he has an on-base percentage of .315. He has totaled 120 hits and he has driven in 60 men in 428 at bats. His OPS+ is 95 while his slugging percentage is at .437. The Cardinals have 1,178 hits, including 245 doubles and 160 home runs. St. Louis has walked 478 times so far this season and they have struck out 1,105 times as a unit. They have left 926 men on base and have a team OPS of .767. They score 4.74 runs per contest and have scored a total of 631 runs this year. San Francisco has a 53-83 overall mark this year. With an earned run average of 3.82, Chris Stratton has a 2-3 record and a 1.43 WHIP. He has 33 strikeouts over the 37.2 innings he's pitched. He's also given up 34 hits. He allows 8.1 hits per nine innings and his FIP stands at 3.74. The bullpen has an earned run average of 4.35 and they have given up 410 base hits on the year. Teams are hitting .260 against the Giants bullpen. Their relievers have struck out 376 batters and walked 182 opposing hitters. As a team, San Francisco allows 9.5 hits per nine innings while striking out 7.6 batters per nine innings. They are 17th in the league in team earned run average at 4.51. The Giants pitchers as a team have surrendered 1,295 base knocks and 613 earned runs this season. They have given up 150 home runs this year, which ranks 26th in Major League Baseball. San Francisco as a staff has walked 414 hitters and struck out 1,030 batters. They give up a walk 3 times per 9 innings while they strike out 7.6 per 9. Their team WHIP is 1.40 while their FIP as a staff is 4.15. As a team, they are batting .247, good for 24th in the league. The Giants hold a .376 team slugging percentage and an on-base percentage of .308, which is good for 29th in baseball. They rank 20th in MLB with 8.5 hits per contest. Joe Panik comes into this matchup batting .270 with an OBP of .332. He has 113 hits this year along with 43 RBI in 419 AB's. He maintains a slugging percentage of .403 with an OPS+ of 94. Denard Span is hitting .264 this season and he has an OBP of .317. He has collected 112 hits in 424 at bats while driving in 33 runs. He has an OPS+ of 91 and a slugging percentage of .410. The Giants as a unit have 1,157 base hits, including 248 doubles and 104 homers. San Francisco has walked 397 times this year and they have struck out on 991 occasions. They have had 930 men left on base and have an OPS of .684. They have scored 3.91 runs per game and totaled 532 runs this season. Who will win tonight's Cardinals/Giants MLB game against the spread?